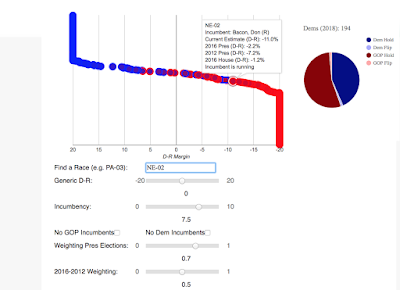 My Congressional tracker. Conveniently, the numbers chosen in the snapshot above are those used for my little experiment below. Lots of folks (including me) are getting concerned about Trump's polls somehow improving, despite (because of?) the neverending stream of corruption. As I've tried to argue, some of his, and the Republicans', apparent improvement arises from the simple fact that it's much easier to take crappy polls than it is to take good ones and the improvement is dominated by lousy polls. How much better (or worse) is a Democrat in a specific district doing than we might have supposed based only on historical data and fundamentals? The takeaway is that, so far at least, individual candidates are polling about 14 points better than the "neutral" environment would suggest. And before you poo-poo the polls, recognize that they've done a damn good job on the special elections. 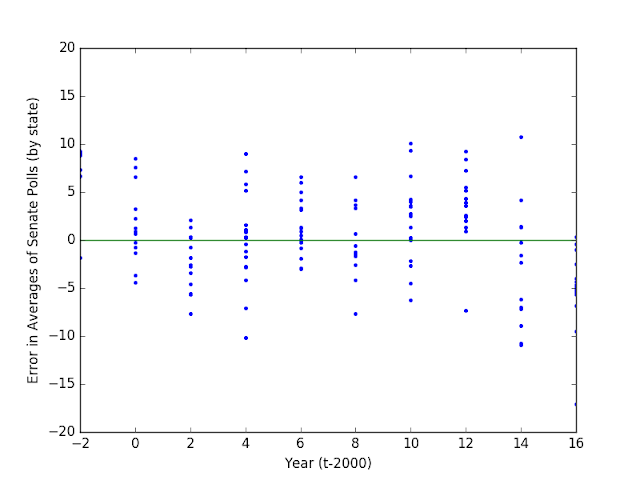 For my calculation, I assume that the GCB is zero and that the "neutral estimate" is based equally on the 2012 presidential election, the 2016 presidential election, and 2016 congressional race -- all normalized to the average of the country and with incumbency advantage removed. (Or, if you're doing it yourself, it's based on the settings in the snapshot at the top of the page). In other words, any swing compared to the neutral environment should be construed as an independent estimate of the GCB -- and it's huge, easily enough to retake the House. In case you'd like to do these numbers yourself, feel free to check out my database and State of the House widget. But it's also worth noting that this 14 point swing is consistent with the ~15 points that we've seen in special elections and much, much higher than the 5-6 point Democratic advantage that we're seeing in the GCB. Put another way, the stories of the Democratic Wave's demise may have been somewhat exaggerated. 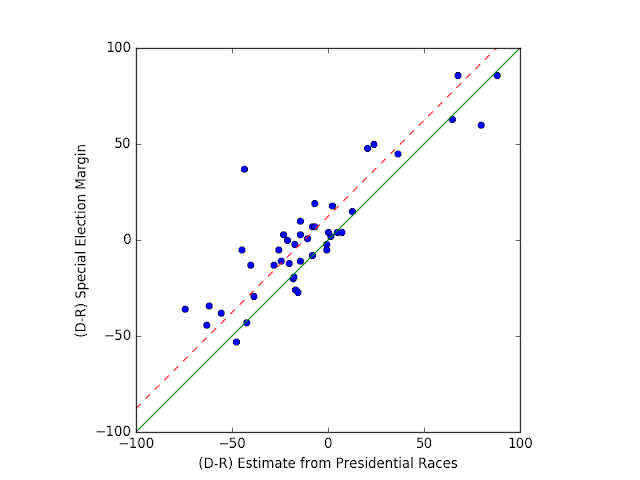 Most prognosticators simply assert that the 2016 presidential election results are the appropriate starting point to consider the "natural" margin for a district. On the other hand, 2016 differs from my "neutral" margin by nearly 12 points. An estimate that's 12 points off would seem, on the face of it, to be pretty bad. But that difference doesn't tell the whole story. Trump lost the popular vote by 2 points, so even if the 2018 results followed 2016 exactly, Dems would still win by 2 points; any excess performance needs to be added to those 2 points. Naively (based on the chart above) you'd expect them to have a 4 point advantage. But also, 3 of the 4 races feature a Republican incumbent. 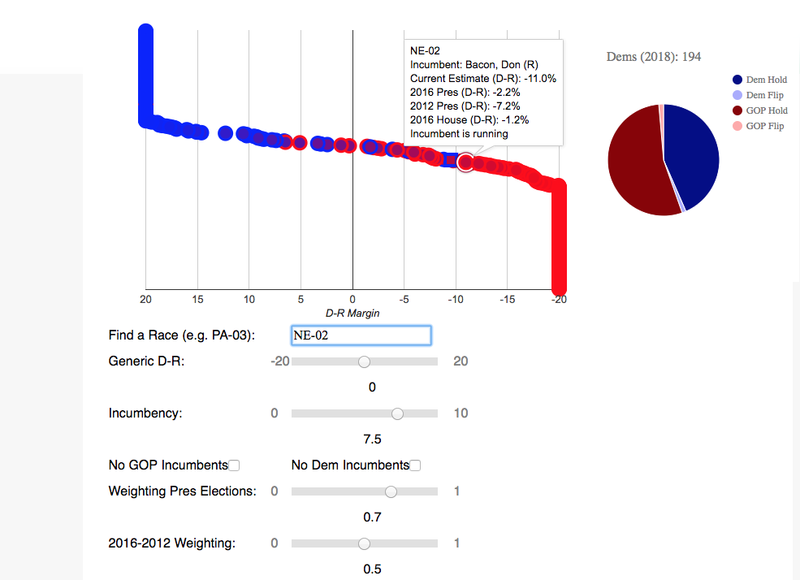 Incumbency lends about a 7.5% advantage, so including that (averaging over the 4) adds an additional 5.6 points to the underlying Republican advantage. Add it all up, and even using just presidential results as your baseline, it seems that current polls suggesting Dems winning by about 10 points. So somewhere between 10 and 14 – probably. It's still early. There aren't very many polls, and they tend to be put out by partisan pollsters (PPP is a Dem pollster, though I've generally found them to produce a slight R tilt), and only in races which people think might be competitive or interesting for other reasons. But, and I think this is important, there are reasons to suppose that this approach might work in terms of an alternative to the GCB. Think about it: Does it make more sense to ask about an abstract "generic" race or an actual one? What's more is even with only 4 polls, that's still about 2000 subjects across 4 states; bigger and more systematic than any single phone-based survey. The formal uncertainty in the margin is only about 2%. The systematics, on the other hand could be larger, but since we're potentially looking at lots of different pollsters, they could ultimately cancel one another out. I'll be keeping the master spreadsheet updated. Be sure to check back.